I like the term cartoonist Hilary Price coined: “Pretendicitis.” However, the technical term Somatic Symptom Disorder (The Diagnostic and Statistical Manual of Mental Disorders (DSM-V) stopped using the older term, Somatoform disorders) refers to the group of diagnoses in which patients complain of symptoms for which no clear medical etiology can be found. Hundreds of millions of US medical office visits are due to somatoform disorders. According to a 2005 paper in the Achieves of General Psychiatry, the cost of taking care of these patients is at least twice that of the average patient without somatoform disorders, due to increased tests and referrals. Even after adjusting for the presence of medical and psychiatric co-morbidity, this stark difference is maintained between the two groups. Differentiating the specific subtypes is important for both ABIM board exam and clinical purposes. 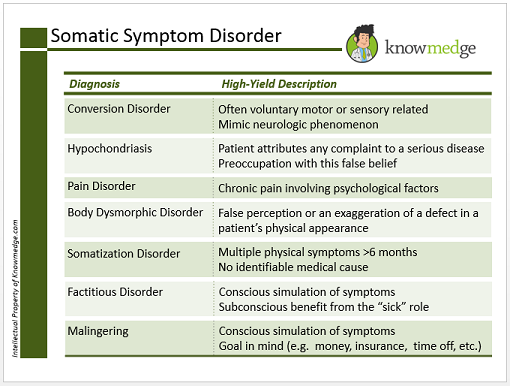 Let’s go through each one and provide you with the highest-yield info you need to answer questions dealing with somatoform disorders correctly on the exam. Conversion disorder: Patient’s symptoms—often voluntary motor or sensory related—mimic neurologic phenomenon. Hypochondriasis: Patient attributes any complaint with a serious disease and becomes preoccupied with these false beliefs. Body Dysmorphic Disorder: False perception or an exaggeration of a defect in a patient’s physical appearance. Somatization disorder: Multiple physical symptoms present for over 6 months without any organic medical cause. Social issues often present. Per the DSM-V, the symptoms no longer need to originate from four different organ groups or body systems, as previous editions stated. However, the patients must be persistently symptomatic and the somatic symptoms are distressing to the point of being disruptive to the patient’s daily routine. Malingering and Factitious Disorder can be reviewed together as they both involve conscious reproduction of symptoms on the part of the patient, unlike the others mentioned above. The difference is that the motives are clear in the case of malingerers but not in those suffering from factitious disorder. Malingering is the purposeful production of false complaints with a specific goal in mind, such as obtaining money, securing an insurance claim, obtaining time off from work or other responsibilities, avoiding jury duty, etc.) In the case of factitious disorder, the symptoms are consciously simulated with with a subconscious benefit from the “sick” role. 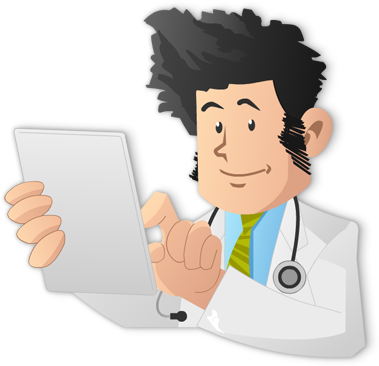 As is the case with any patient complaint, the typical diagnostic work-up should be employed in ruling out medical etiologies. Since, depression may co-exist with the patient’s symptomology, it’s important to treat depression, which could potentially improve the patient’s overall condition. Given all that we know, what diagnosis would you give the child in the comic at the top of this post? Feel free to copy, download and share the above high-yield table with your friends as you study for the ABIM Internal Medicine Board Exam.